NC State (4-1) beat Notre Dame (2-4) 10-3 in a messy game in Raleigh, North Carolina. The Wolfpack saw a big game from their running back Matthew Dayes who ran for 126 yards on 26 carries. The only touchdown came on a block punt by Pharoah McKever and a return by Dexter Wright. 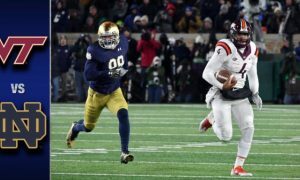 Notre Dame quarterback DeShone Kizer finished with 54 yards and an interception on 9-of-26 passing. He also had a fumble and 15 yards rushing.